I miss the smiles of my wide-smiling Phoebe before cleft lip surgery. Her smiles seemed to touch her whole face. I miss the kisses from her lips that brought untold joy to my heart. She’d reach up to offer me her closed yet open, puckered up lips. As I kissed her lips, I also kissed her front two teeth. 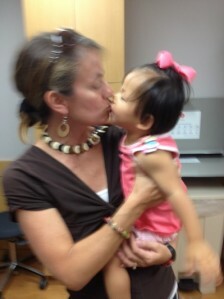 We cleft mamas know the delight of these lip/teeth kisses! Before surgery, we grieved the loss of these conversations that were so easy to have with Phoebe’s “broken lips.” But more so, we grieved that surgery would change the face that we fell in love with upon a referral in our inbox. June 24 we went to the hospital. I tried to memorize every little detail about her face. In China, there is something called “saving face.” Saving face is to protect oneself from embarrassment or shame. 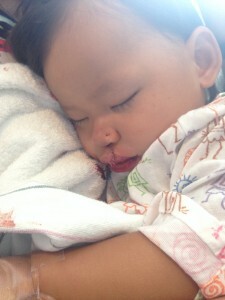 But before surgery, I wanted to save her face in my mind. I wanted to save every detail about her nose, lips, smile, and expression into my brain and heart. As I looked at her, I tried to burn the memory of her smile and the feel of those kisses in my mommy memory bank reserved just for Phoebe. When we handed Phoebe over to be taken to the operating room, she looked back at me. I looked one last time at her face with the cleft lip. She turned the corner, and I cried. Other parents, in that same place, wave goodbye in concerned about their child having surgery. I wept knowing that what was broken would come out new. 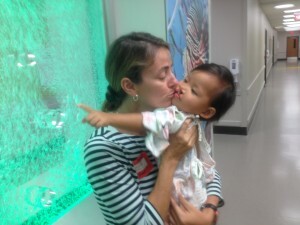 You see, a mama of a cleft child is not hastily moving their child towards surgery to change the face. It’s not a cosmetic surgery for beauty. It’s a surgery to give the child a chance to communicate with words. Parents of children with clefts are not counting down the days until surgery, they are counting the days they have left with these delightful faces we love. 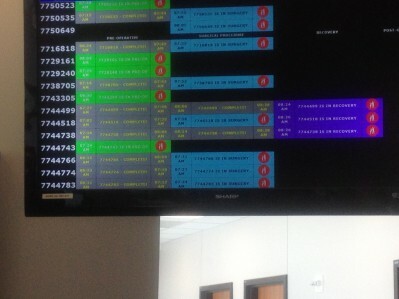 Later, a phone call came that said, “The surgeon has begun and Phoebe is doing well.” I looked up at the board and saw her number. I went out in the hallway and struggled. I wanted to yell, “Stop! Save her face!” I obviously know in my head that this surgery was huge for her; it will give her the ability to talk. And I am deeply grateful. But these lips are why she is my daughter. You see at one point in our adoption process, we checked boxes of special needs we thought God might want us to receive into our family. We checked the box for a cleft lip and palate. We prayed that God in His amazing wisdom of our family would look over China and choose a child for us that He wanted to be part of our family, part of our mission as a family. 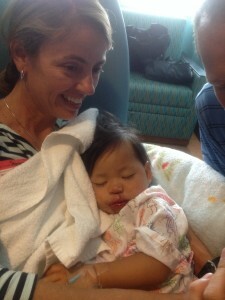 Phoebe was placed in our arms by God in His infinite wisdom and her lips are how she is with us. God brought these lips into our family. We are a family that speaks, preaches, teaches, and proclaims. Isn’t God great to give us these lips to repair for His glory and for someday her telling His story? Finally, they moved Chad and me to the hallway that held a tiny Phoebe on a huge bed. She was confused and sleepy but sitting up trying to figure everything out. I only saw the back of her head. She heard my voice and turned around, and I caught my first glimpse of her repair. She immediately jumped up and crawled into my arms dragging the IV line with her. I held onto her as others saw her repair more clearly. I tried to catch more glimpses, but when I felt her warm arms trying to crawl into me for comfort, I simply acted like her mommy. I held onto her and whispered that she was my Phoebe and I was her mommy. She clung to me; I clung to her. When we were finally back in our hospital room, I sat holding our daughter while Chad patted her sweetly. Grandparents, aunts and friends cried looking at the repair and declaring, “She is beautiful. This is amazing.” They also worked around me trying to make me as comfortable as possible as I held her since I had recently experienced a bulging disc (ouch, ouch, ouch). As they looked at her, I realized I had not yet really seen her changed face. They got a phone and made it possible for me to look at her. To be honest, I was astonished how different she looked. You know you can look at pictures of your kids when they were young and see how they changed over the months and years. But the change is not drastic as you raise them because it happens little bit by little bit. But with a cleft lip surgery the change is so quick. It’s astounding. At one point during her first day of recovery, she looked into my face with sleepy eyes and examined me; it almost felt like she was trying to gauge my reaction to her face. In that moment I saw her heart. It seemed to say, “Mommy, are you here? Are you with me now? Will you hold me and not let go?” In her grogginess, she reached up and offered me bleeding lips to kiss me that seemed to whisper, “These still work mama. I can still kiss you.” We were a team – each exuding nurture to the other. Those lips brought us together as mother and child. The day leading up to and the actual day of surgery, I could not quit thinking about her birth mom. Phoebe’s lips caused her birth mom to sacrifice and give. These lips caused me to open my arms and receive. I was drawn to her birth mom and so often as I held the healing Phoebe, I lifted her mom up to the throne of heaven and begged God to send someone to tell her the Good News of Jesus Christ. I so want to meet her in heaven! She is from the most un-evangelized area of China. Please join us in praying that somehow she will hear of Jesus and respond. As I held Phoebe on day two after surgery, she finally ate and drank milk. As she sat resting in my lap, she began to do her thing. Babble and hum and talk. For the first time in Phoebe’s life, I heard her say the “m” sound. Twenty-four hours earlier she couldn’t make the sound, but because of surgery, the sound was flowing. I sat there in awe and gratitude. Phoebe is still a bit swollen. She is trying to get those smiles out there despite a very swollen lip. She has offered me bundles of kisses. She continues to climb, run, and leap off of couches. She’s my same Phoebe; she just looks different. I will cherish her look before, and I cherish her look now. Yes, Phoebe’s lips were broken. Her life was broken. She needed surgery and she needed a family. God has provided both to her. Her broken lips remind me that Jesus Christ wants to repair anything broken by the Fall and make all things new. For Phoebe’s surgeon to repair her lip, he had to cut, repair and stitch. We signed our names on a line in the hospital to give him this permission to. Bleeding and swelling and bruising followed. So God must have the freedom to cut, burn and remove in order to make us new. God repairs and restores. His work to renew also hurts but in the end, we are repaired and can better speak Truth and display a changed life for his glory. To God be the glory. 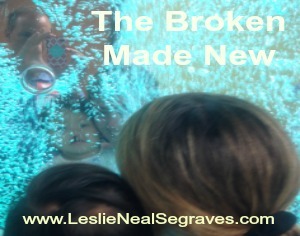 Join the Conversation: In what way have you been broken and in need of repair by God? Was the renewal painful? What is the result of the change God brought? Such a touching, beautiful and inspirational story. I am so blessed and grateful for your continuing testimony of God’s sovereignty and sustaining grace. Thank you so much! God has been so good and it’s fun (and challenging!) to be on a journey with him! So appreciate your continual encouragement. Thank you for sharing your part in this journey of healing for Phoebe. I hadn’t realized it was the birth defect that allowed God to select and place her into your arms and family. Your transparent testimony is encouraging to us all. May God continue to use your precious daughter teach us all about God and his depths of love. Hi Diana. Yes, we chose to go the special needs route in China. You have to go through this huge list of needs and check boxes that you’re willing to receive. it’s very, very challenging to do because all children deserve families. We sought to choose needs that we felt we could continue to travel as a family into difficult areas, at times with very limited medical care. it’s complicated how referrals work, but basically our file matched hers. Since there are so many Asian children with this problem, seeing her little personality makes us KNOW God chose her for our crazy family! And yes, she continues to teach us about the amazing adoption of us into God’s family! Sign up to receive my blog posts via email and get a FREE guide to pray for outward-focused children.